(Top L-R) Turan, Cloma, Blazo A. and Blazo R. (Bottom L-R) Cagulada, Guevarra and Digal. EightÂ men and one woman allegedly involved in illegal drug activities were arrested in separate anti-drug operations conducted in various towns in Bohol on Friday. These operations are part of a two-day â€œOne Time Big Timeâ€ anti-drug drive which started at 12:30 a.m. Friday. The arrests started at the wee hours in Ubay as the townâ€™s police conducted a buy-bust operation against Julieto Turan, a resident of Brgy. Poblacion of the said municipality. 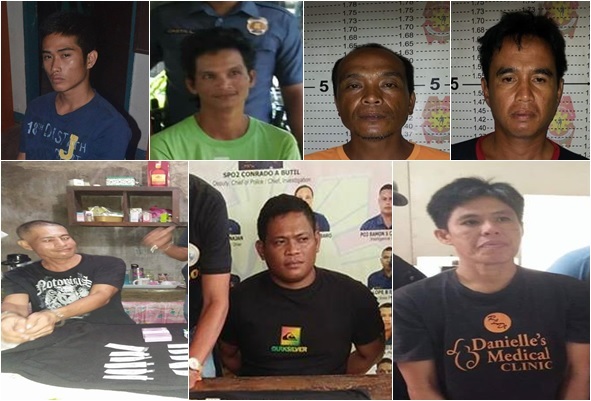 The operatives led by Ubay police chief Insp. Roland Lavisto recovered three packets of suspected shabu from the suspect. In Dauis, municipal police collared 45-year-old Arnold Brazo of Prk. 4 Brgy. Mayacabac of the said town. 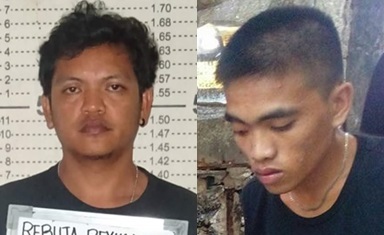 Four packets of suspected shabu were recovered from the suspect following the buy-bust operation conducted against him at 1:35 a.m.
Five minutes after police caught Brazo, the operatives subjected the suspectâ€™s cousin who is also his neighbor in a buy-bust which also resulted in an arrest. Police identified the suspect as Ronald Brazo, who yielded three sachets of suspected shabu as operatives frisked him. At 5 a.m., Loboc police operatives raided the home of Beatriz Digal, 43, who is a married resident of Brgy. Alegria of the said town. Armed with a search warrant, police raided Digalâ€™s home and recovered 5 sachets of suspected shabu and drug paraphernalia. In Valencia, another raiding team served a search warrant against 43-year-old Allan Cagulada, a resident of Brgy. Taytay in the said town. The municipal police, led by Valencia police chief Insp. Ardioleto Cabagnot, raided the home of the suspect at 6 a.m. They were able to confiscate five packets of suspected shabu and drug paraphernalia fromÂ Cagulada. An hour after, Sierra Bullones police subjected one Dante Guevarra, 36, to a buy-bust operation. Guevarra, a reisent of Brgy. Poblcaion, Sierra Bullones, was immediately arrested after he sold suspected shabu to an undercover policeman worth P500 near his home. Police recovered from him five packets of suspected shabu and the buy-bust money. In Panglao, police operatives arrested a noted drug pusher in the town through a buy-bust operation. The suspect was identified as Robert â€œBabetâ€ Cloma, a resident of Brgy. Danao, Panglao. Cloma was also caught in possession of three packs of suspected shabu during the buy-bust conducted at 1 p.m.
At past 11 in the morning in Corella, police apprehended drug suspect Reynaldo Rebuta. He was also subjected in a buy-bust operation which resulted in his immediate arrest. In Tagbilaran City, personnel of the Provincial Intelligence Branch and the Garcia Hernandez police arrested Joseph Salise in a joint buy-bust operation. The 20-year-old Salise, a resident of Brgy. Pasong, Garcia Hernandez, was arrested in Doria St., Tagbilaran City at 4 p.m. He was caught in possession of 12 packets of suspected shabu. According to Insp. Rey Olar, chief of the Garcia Hernandez police, Salise is included in their watch list of drug personalities. All nineÂ drug suspects surrendered to authorities in their respective towns for involvement in illegal narcotics through Oplan Tokhang. They are currently detained at lock-up jails in their respective towns pending the filing of charges against them. Inspector Ardioleto Cabagnot is the chief of police in Valencia who led the arrest of Â drug suspectÂ Allan Cagulada. We are extending our sincere apologies to Mr. Cabagnot and his family for the honest mistake.